Comfort food always seems to be the best option when winter hits and its cold out. There’s something about that heart warming, soothing dish that just seems to put everything at ease when it’s freezing outside. 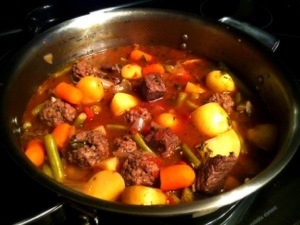 I like to turn to a good beef stew. With the ground beef, make 1-2 inch meatballs, and place on a microwave safe plate lined with paper towel. Put in the microwave and cook on high for 5 minutes. Heat a large pot on high heat, and drizzle olive oil. Brown the stewing meat, about 5 minutes. Add the onions and garlic and cook until soft, about 5 minutes. Add the herbs and cook 1 minute. Pour in the wine and scrape up the drippings at the bottom of the pot. Add the potatoes, veggies and canned tomatoes, with their juices. Add the beef stock and bring to a boil. Simmer for a least 1 hour. Season with salt and pepper. Note: if you find that the strew is too runny, mix 2 tbsp of cornstarch with 1/2 cup of cold water and slowly add it to the stew, until desired thickness. Serve with fresh buns. Don’t forget the ketchup! !